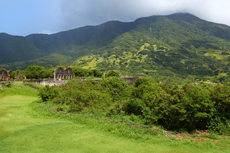 Experience the heights of St. Kitts with a climb to the top of Mount Liamuiga, an extinct volcano. Beautiful, scenic trip to Soufrier and the volcano. Beautiful, scenic trip to Soufrier and the volcano. Best tour guide I&apos;ve ever had. Only caution is that if you are prone to motion sickness, wear a patch or take something before. The roads are winding and hilly. A very strenuous hike, but very rewarding for those who made it to the top, like myself. A very strenuous hike, but very rewarding for those who made it to the top, like myself. Very glad I booked this tour! DO NOT TAKE THIS EXCURSION FROM ROYAL CARIBBEAN! The description said Strenuous and it was EXTREMELY Strenuous!! The shore excursion in St.
Code: KT63. I loved this hike! It was hard, but well worth the effort to get to the top. Good shoes are a must, the trail has a lot of tree roots and there are slippery areas. This was the best excursion experience I have ever had. This was to be a 6 mile hike to see the volcano (3 miles up and 3 miles back). This was a bucket list for most everyone in my family! Don&apos;t do it unless you&apos;re in shape. Don&apos;t do it unless you&apos;re in shape. Wear hiking shoes and bring your own food and water. You will get dirty. We&apos;re sub-30 and in great shape. Dangerous tour.mtge group left late and then tried to make up time by rushing up the mountain. Dangerous tour.mtge group left late and then tried to make up time by rushing up the mountain. Half the group dropped out before reaching the summit and all returned scratched up from slips and falls. Not an easy hike - becomes a very difficult hike if wet. Beautiful but really hard. I was bruised and hurt for 3 days - had to use a lot of upper body strength to "hike" It was more of a climbing excursion vs hiking.